Longstanding member of the People’s Progressive Party (PPP) and General Secretary of the Woman’s Progressive Organization (WPO) Sheila Veersammy was moments ago sworn in as the new PPP MP replacing Clive Jagan. Jagan announced his retirement recently after he had fallen ill and the PPP was mandated to select another person from its lists of Representatives to fill his vacant seat. In an interview with Demerara Waves shortly before her swearing in the WPO General Secretary said that she will be bringing honesty to the House devoid of heckling. “I have my honesty, my clear cut vision – totally, my character totally depends on that. 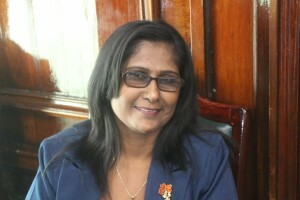 My personality will help to bring a light of fresh air to the parliament,” she told Demerara Waves. Veersammy said she is very objective and has clear cut questions and she hopes to receive clear cut answers without the usual heckling from MPs. “The National Assembly for me is made up of some peculiar things that is rules and regulations that we all have to follow…I will be bringing the needs of the constituencies to the parliament and I will used my stint here to have these matters resolved,” said Veersammy. She confessed that while she does not have any immediate plans for the National Assembly, she will be supporting the actions of her Party. “In so far I do not have any immediate plans that I am going to be bringing to the parliament and as far as I know I will be supporting what the Party brings to the parliament,” the new MP stated. Speaker Dr Barton Scotland in welcoming the MP to the National Assembly expressed hope that she would bring some changes.